The newest MSI 915P Neo2 Platinum motherboard adopts Intel® 915P and ICH6R chipset, supporting new Intel standards such as LGA775 Pentium® 4 Prescott processor, dual channel DDR2 533 memory architecture, and PCI Express X16 graphics interface. The MSI 915P Neo Platinum even supports dual channel DDR2 667, the future memory specification. PCI Express X1 expansion slots and 7.1 High Definition Audio are supported by the ICH6R chip, but also Intel® Matrix Storage Technology and Matrix RAID. Actually, it combines the advantages of conventional RAID 0 and RAID1. It increases your system’s performance and protects your important data with only two hard drives. An additional VIA RAID controller and two extra IDE interfaces onboard enables you to configure RAID 0, 1, 0+1 or JBOD for more flexibility. Furthermore MSI 915P Neo2 Platinum motherboard offers MSI Corecell, MSI D.O.T and new unique MSI features such as MSI SafeBIOS, MSI V Power, MSI Active MOS, MSI META I/O, MSI Live Update 3 and MSI Digicell. 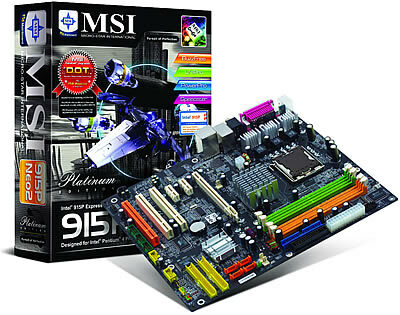 MSI Platinum motherboard series: stability and performance count For MSI Platinum motherboards MSI admits only high-quality components and validates with existing DDR2 memory modules such as Samsung, Infineon, Micron, Hynix, Elpida, Kingston, Corsair, GeIL, Transcend and other A-brand memory brands. Also every single memory chip on the Intel® official website mentioned was checked on their compatibility. You can find the latest test results on the MSI product web pages. MSI’s exclusive ASIC chip represents MSI serial MS-5, MS-7, MS-8, and other chips. Their functions includes more BIOS control options under MSI Cell Menu, MSI D.O.T. (Dynamic Overclocking Technology), MSI SafeBIOS (BIOS Automatic Recovery) and MSI V Power (CPU Voltage Precisely Compensation Mechanism). MSI V Power is MSI’s hardware solution for a solid stability under high-speed processing. While CPU utilization is high, the CPU is very sensitive to fluctuations of CPU voltage (Vcore). Unexpected fluctuation of CPU could cause a system crash. V Power allows you to accurately adjust the CPU voltage. The compensation mechanism inside MSI CoreCell chip minimizes fluctuation of the Vcore and maximizes the system’s stability and reliability. MSI SafeBIOS will automatically restore BIOS from the backup area, whenever your BIOS update fails or you suffer from virus attacks. Only MSI CoreCell chip (MS-8) has access to the backup area and other approaches are prohibited. MSI Active MOS is the 3rd hot spot on the motherboard; second to the CPU and North bridge chipset. Active MOS is a reverse design of MOS. It directs heat dissipation to an aluminum heatsink rather than to the PCB. It prolongs the life of your components by reducing the temperature. MSI Meta I/O™, the complete rear I/O option for supporting all external accessories. It includes all types of SPDIF, Coaxial, and Optical connectors from IEEE 1394 to DV camcorder, and supports 7.1 channel surround sound for High Definition Audio. MSI Digicell is the especially for MSI Communication slot designed user interface, which helps users start-up their access point and gateway in just two clicks. You are only two steps away from turning your MSI motherboard into a Digital Home Center. MSI’s Wireless LAN card is designed for the budget-minded consumers. It eliminates the cost of a physical access point and IP sharing device. You can actually upgrade your PC system into a home server for digital entertainment for your family to enjoy. MSI Digicell also supports onboard features for MSI MEGA Stick - MP3 player. You can easily manage your MP3 play list and speaker settings. MSI CoreCell Chip has four technical features: Speedster, BuzzFree, PowerPro, and LifePro. The MSI Speedster technology of MSI CoreCell Chip contains the most flexible BIOS options for overclocking, including async mode of FSB and memory frequency, 0.05V increment for memory voltage adjustment and the minimal increment of 0.0125V for Vcore. - MSI BuzzFree examines the current system utilization and temperature level before leveraging thermal requirement & fan speed. It dramatically cuts the system noise by 50% and gets rid of annoying noise. Moreover, it also improves the quality of your audio and video. - MSI PowerPro prolongs the life of the motherboard, CPU, and fan by maintaining them under the optimum condition. It also detects and manages the motherboard utilization to prevent a system crash. - MSI LifePro prolongs the life of the motherboard, CPU and fan by maintaining then under the best condition. It can also detect and manage motherboard utilization to prevent possible factors that may contribute to system crash. MSI CoreCenter™, this all-in-one hardware console is an advanced combination of the popular MSI PC Alert and MSI Fuzzy Logic applications. It offers powerful functions such as hardware monitor, system alert, and instinctive overclocking user interface. MSI Live Update™ 3 is single utility software that automatically checks BIOS and driver updates. It includes MSI Live BIOS™, MSI Live Drive™, MSI Live VGA BIOS™, and MSI Live Utility™. You also receive the latest information about MSI products and activities.